Few will argue that rookie cards, commonly referred identified by the acronym RC, are a strong driving force behind the hobby - especially when it comes to baseball rookie cards and 1st year prospect baseball cards. Since the 1980's when sports cards first transitioned from a casual hobby into the large industry that it is today, the first cards of a player have always, and undoubtedly will always, remain a key factor in the card's value, importance and collectibility. Identifying football, basketball and hockey rookie cards is relatively straightforward process but baseball rookie cards are truly in a league of their own. The confusion and complexity surrounding baseball rookie cards can be traced back to the advent of one of the best baseball card sets of the 90's, 1992 Bowman Baseball, which was the first in a new-look line of Bowman products in which Topps completely rebranded and remarketed Bowman as a prospect and rookie-centric product. This move immediately struck a cord with collectors, leading to the emergence of a huge wave of interest in collecting Minor League Prospects and largely unproven but intriguing rookies with high upside. Topps immediately capitilized on the success of and demand for such products by releasing a slew of incredibly popular (and extremely high selling) sports card brands that continue to this day such as Bowman Chrome, Bowman Draft Picks and Prospects, Bowman's Best and more recently Bowman Platinum, Bowman Inception, Topps Pro Debut and many more. However this, in conjunction with rules laid out from Major League Baseball as to what could constitute an "Official Major League Baseball Rookie card" blurred the line between 1st year prospect cards and rookie cards, making it decidedly more complex affair. In this article we're going to lay out the difference between the two so that you can be armed with the knowledge necessary to help you make educated collecting and buying decisions in relation to baseball rookie cards. While this example could be applied to virtually any baseball player, we are going to use Brett Lawrie of the 2011 Toronto Blue Jays as our working example. Shortly after his Toronto debut, eTopps offered a fully licensed card of the slugging third baseman in a Blue Jays uniform. The card even has the logo instituted by the MLBPA to designate official rookie cards. Although lots of people shun the eTopps platform, it has all the hallmarks of what a rookie card should look like. Skip ahead a couple of months and take a peak at 2011 Bowman Chrome Baseball. Lawrie's in there too, wearing his Toronto threads. That would make it his first pack-inserted rookie card, right? Not officially. It's part of the Prospect card checklist. Confused? I am. Why can a card with a rookie logo be in one set, but another from a latter set not have it? 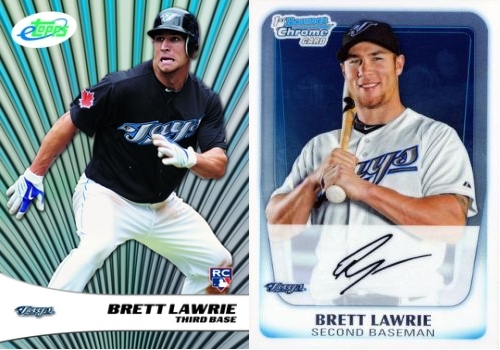 Technically, Lawrie's Bowman Chrome card is an insert so it can't be a rookie. I get it. But it doesn't make it logical. One would think that Topps' exclusive license would make it easy to keep track of what's a rookie. Instead, it's becoming an increasingly chaotic landscape that may sell some products today, but are bound to hurt the hobby in the long-run. Not long ago, most every collector and publication agreed on what a rookie card was. In a nutshell, it was the first fully licensed base card issued of a player for any given brand in a single year. For example, Randy Johnson's rookies are in 1989 Topps, 1989 Upper Deck, 1989 Fleer and 1989 Score, amongst others. Although released in the same year, his 1989 Topps Traded and 1989 Score Rookie & Traded cards aren't rookie cards because he already had base cards from the earlier releases. Jerseys didn't matter so much either. Some might say differently, but Mark McGwire's rookie is 1985 Topps Baseball. He may be wearing a USA uniform, but the card was part of a set licensed by both MLB and the MLBPA. Those claiming the slugger's 1987 Topps or 1987 Donruss cards to be his first A's cards would be correct, but they're not rookie cards. Even in the 1980s, there was some confusion, particularly surrounding late-season traded sets as they weren't always readily available. I'd still argue that Roger Clemens' rookie is in 1984 Fleer Update and not in 1985 sets. While they may have been tough to track down 20 years ago, the advent of the Internet has largely removed shunning regional releases. Outside of a few exceptions, defining a rookie card was easy and most everyone followed a similar logic. In later years, Topps ended up with an advantage, though. They have a grandfather clause with their licensing that allows them to sign players to individual contracts. As a result, they had a window to land players as soon as they were drafted and put them in their sets. In many cases, they beat their competitors by several years. This eventually led to a changing of the rules that was supposed to both level the playing field and make things easier. That never happened. Before the 2006 baseball season, the MLBPA announced some changes that were meant to make defining rookie cards easier. Both Topps and Upper Deck were on board but, honestly, things just got more confusing and a window for a new breed of pre-rookies opened. With the rule change, official rookie cards were only made after a player appeared on a team's 25-man roster. In its most basic form, it was a great idea. Collectors chase rookie cards when they're first-year players. The rule has had great success in hockey. Although not an official rule, it's like this in basketball and football too as players generally make their team's rosters fresh after the draft and don't spend several years developing in a minor league system. But the new baseball card rule had some issues right off the bat. Many players had fully licensed cards from 2005 and before. Ryan Braun comes to mind. But with this new rule, the MLBPA expected collectors to all of a sudden disregard the rookie card label and chase his 2007 cards instead. Not likely. Topps didn't help matters either by continuing to insert freshly drafted prospects in their Bowman sets. But they were following the rules mandated to them by making them a separately numbered insert set. That may be true, but it's still problematic as these prospect cards carry the same design elements as the base veteran cards, are inserted at similar rates and picture players in their MLB uniforms. These prospect cards are also the main selling point in the Bowman marketing materials. So here we have cards that look like rookies save for a slight numbering variation on the back and one missing logo. At the same time, several competing non-licensed sets started coming out. They rose from lost licensees like Playoff (now Panini) and Razor (now Leaf). These were high-quality sets that included lots of top prospects, autographs and inserts. Collectors accepted these sets in higher regard than traditional minor league issues. They also helped create a market for prospect cards that were, again, better than minor league cards and, in many instances, almost on par with official major league rookies. With full licensing becoming less of an issue on the baseball card landscape, a side effect has been what to make of the Bowman "prospect" cards. The market is often holding them at a higher value than official rookie cards. But we're supposed to dance around the fact that they're not? For new collectors, this makes little sense. And with the confusion of players like Lawrie where they have a rookie in one set but not another that is put out at a later date, there needs to be a simpler process. But with the higher profit margins that prospect sets bring, this might be unlikely. With Topps holding exclusive baseball card rights on Major League cards, it's up to them to simplify the baseball rookie card process. They're currently playing by the rules given to them. But for the long-term good of the hobby, things still need to change. And there's a simple solution that will make things easier for collectors and make their minor league brands distinct: Bowman goes minor-league only. Let's be honest: the majority of collectors buying Bowman products are prospectors looking to stockpile the first cards of up-and-coming stars. Topps knows this. Bowman's slogan is "Home of the Rookie Card." It used to be, but last I checked the 2011 Bowman Bryce Harper still wasn't officially his rookie card, despite the high prices it sells for. Bowman is still home to most of the first MLB cards for a lot of players, but without that MLBPA logo, we're supposed to regard them as prospect cards. What if Bowman dropped the Major League content altogether and became a minor league set? This would clear up a ton of confusion over what's a rookie and what's not. With the secondary market caring less about licensing as they were in the past, prospectors could still have their autographs and first-year cards. Even a parallel of players in their MLB uniforms could be part of the plans. Yes, spinning Bowman off would affect sales as some collectors avoid minor league products. But with a defined focus and a little marketing, I think these sets could still make money. Topps has some creative people on staff and collectors would be happy to offer ideas if they were asked. With the branding already in place, Bowman could define itself as the premier minor league issue and bring some prestige along with it. But why mess with a good thing? With the lower costs involved in getting prospects to sign cards, Bowman is extremely profitable for Topps. Sure there's going to be some reluctance to surrender some of that money. But I think there's some added spinoffs that make up for any shortfalls. First is the simplification of what's a rookie and what's not. With the complete separation of MLB cards and MiLB prospects, rookie cards truly will come after a player has made their team's main roster. Rookie cards will be inline with their counterparts in the football, hockey and basketball. As a collector, I'd rather chase rookie cards in their rookie year, rather than having to go to the secondary market to collect older sets. Yes, that's somewhat the case now if everyone played by the same definition, but we don't. Also, if Bowman becomes a minor league brand, it opens up additional slots for Topps to make more sets. As it stands, they're limited to the number of releases they can do in a season. If Bowman falls under the minor league roster, several additions can be made. Since Topps took over exclusive rights, there have been some big gaps in new product for collectors, particularly if a couple of the newest sets don't appeal to them. This is a way Topps could fill in some of those gaps, offer more cards and maintain momentum. And these new sets could all potentially focus on rookies, filling the hole of making Bowman minor league. I'll freely admit I don't know the complete economic picture of what goes into making a set profitable. But I do understand things from a collector's perspective. I want to build a great collection with the best cards of a player I can find in my budget. The current landscape is confusing and tricky to navigate. And I've been collecting for more than 20 years. I can only imagine how overwhelming it is for new collectors or for those coming back to the hobby after a break. The underlying theme here is that baseball rookie cards need to be made clear again. Ultimately, it's up to the individual collector to decide what they want to collect and what they're happy with defining as a rookie. But because rookies are such an integral part of the hobby's foundation, there is no reason for there to be the splintered opinions and overall confusion we find today. I have a 1989 Topps Rookies pack, in clear plastic. There are probably 20-25 cards in the sealed pack. i can only see the front and back cards (both face up). Those players are Jim Abbott and Ken Griffey Jr. I have been unable to locate anything like this online. Any suggestions or assistance in determining value would be appreciated. Larry � If it’s an original Topps pack, it sounds like it might be from 1990. Although it’s tough to tell without a picture, it’s unlikely that it’s worth much unfortunately as there is so much Topps stuff from that era. I think a rookie card should be the first to hit the shelf after a player played his first pro game. No matter what company or what set, that ‘first on the shelf’ title should hold… as long as its got the player’s face in the photo or drawing and is not a minors card. I mean, if upper deck got a bit faster on their printing, packaging and shipping one year… that should be the rookie. Any other sets should also be released at least a month after the main base set of the company. Minors cards should be minors cards… then again, that could open up a niche for last minor card. Maybe we should just let the players decide who prints their first rookie. Like they decide on sponsors. Play their first game then pick who will take the photo for the card. His card would be a part of the base set. A one month waiting period before other companies can put the player in as an insert card. Anyway… hope it gets cleared up, I’m getting back into collecting and a bit has changed. Card manufacturers over the past twenty five years have shown they will ramp up production any way they can for their own profit. Most of us are already familiar with overproduction of 80’s cards and the increase in the number of sets starting in the 90’s. But also in the 90s, Topps started overproducing another way – this time using minor league subjects. Of course I’m referring to Bowman featuring minor league players on MLB cards. The number of cards featuring minor league subjects went from close to nothing to millions in a year or two. Wow. So because of this license manipulation, not only does the hobby have tens or hundreds of thousands of different cards of MLB players on MLB cards every year… it now also has to deal with the tens or hundreds of thousands of *MiLB* players on MLB cards every year. After twenty years, this has meant millions of “extra” MLB cards featuring MiLB players – – most of whom never take a single AB in a MLB ballpark. This is overproduction. So while people may blame the decline of the hobby starting in the 90’s on the baseball strike or the internet, the more likely culprit of the decline is the extraordinarily large number of subjects available for MLB cards. Are MLB cards special anymore when MLB players don’t have to be on them? If Bowman were to go 100% minor league – as I agree it should – I expect Topps to attempt to introduce new ways to generate income using its MLB license. I wonder what they’re going to try to overproduce next… is it possible to overproduce virtual cards? Topps worked hard to increase the popularity of its Bowman brands, and it will certainly use what it learned to promote whatever comes next. So its up to collectors to use common sense when looking at card prices or reading discussion board content because everything that you see may be driven by Topps and not your fellow collector. For one thing, don’t let Topps create artificial tension between investing and collecting to generate its sales, otherwise you wind up with a hobby with minor league players on MLB cards! I am trying to put together a card collection of the 1969 Royals. I grew up there and as a child lived by several of the players. There are 7 players that are on the roster that I cannot find a card for in the databases. There are cards for 1970 but not 1969. Can someone please tell me why? I’m trying to put this together for my daughter. Thank you. Can someone tell me which Mike Montgomery card(s) are official rookie card(s), I’m trying to put together a collection of the 2016 WS Cubs and this one stumps me!